Snakes are long, legless reptiles belonging to both the order Squamata and the suborder Serpentes. These cold-blooded animals exist on every continent except Antarctica, placing them in a wide range of ecosystems and environmental conditions. Because of this, it’s important for snakes to have a way of maintaining homeostasis and thermoregulation in any type of environment. Homeostasis is the process of maintaining a consistent environment inside the body. For warm-blooded animals such as mammals and birds, homeostasis is a combination of internal processes involving hormones, the endocrine system and metabolism. Cold-blooded animals like snakes, on the other hand, have no such internal systems in place, and must rely on their external environment to maintain homeostasis. Snakes and other reptiles are ectotherms, which means that they have no internal means of regulating metabolic function. In cold weather, snakes tend to be sluggish as their metabolisms slow down, whereas in warm weather they tend to eat more and move more quickly. Ectothermic animals don’t get their energy from caloric intake the way warm-blooded animals, or endotherms, do. This allows ectotherms the survival advantage of being able to go longer without meals. Thermoregulation is the process of regulating body temperature, which is a major part of homeostasis. 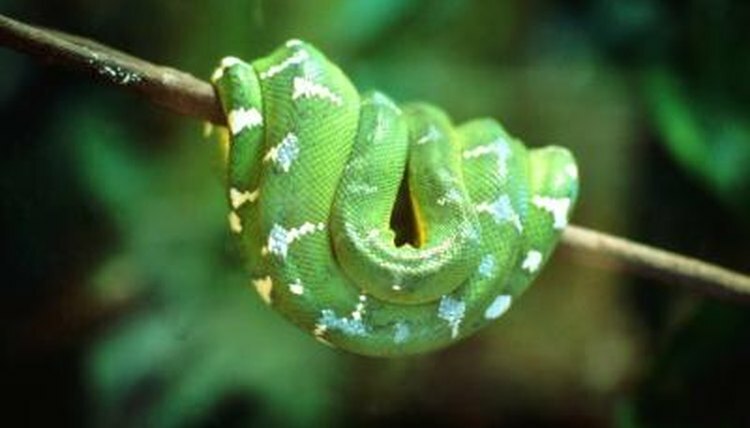 Snakes and other ectotherms are cold-blooded animals that lack the ability to generate body heat internally. Also known as poikilotherms, these animals must rely entirely on external sources to regulate their body temperature, both to stay warm and to avoid becoming overheated. Like other reptiles, snakes are most active during the day, using the sun’s rays to warm their bodies as they hunt for food or simply bask in the sunlight. The heat of the sun speeds up the metabolism, giving them energy and helping them to digest their food. They will also hide in shady spots or burrow underground during the hottest part of the day to avoid overheating. Snakes usually spend cold weather months underground in a state of hibernation, during which their metabolism becomes very slow, allowing them to sleep for weeks without food.